Indian cuisine is getting more popular around the world. First, it was accepted by vegans and vegetarians, but as time goes on, others started to love it too. This colourful realm of colour, smell and taste, makes few people indifferent. Many spices that are used around the world, such as turmeric, coriander and saffron, arrive from India. In our article we will give you some excellent proposals for Indian dishes, be sure to stay tuned. Why is Indian food so much appreciated and healthy? Almost all the delicious dishes of the world, at least somewhat, reflect the magic of the country of thousands of languages. A pinch of black pepper, two pinches of turmeric, coriander and a little saffron, only to give food that special, exotic stamp and bring a touch of India, given the fact that all these spices descended from there. This is a country that will, as soon as you step on its soil, hit you with a mixture of different cultures, and the air smells densely interwoven with traditional specialties of characteristic tastes. Precisely such an impression on us leaves Indian cuisine, exotic and very delicious food of various aromas. Do not expect cutlery, as residents of India are know to eat food with their fingers! If you are a fan of delicious steaks, you will be disappointed to learn that pork is not the most desirable food in India, considering that Muslims make up a large part of the population of that country. On the other hand, cow is also considered a sacred animal, so it is clear that in Indian cuisine it is not recommended to eat beef specialties. Fish is represented in areas around the river, while the chicken and lamb are unavoidable on the table in the mountainous regions of India. This means that Indian food is not abundant in fat, but on the contrary is full of valuable protein. On this occasion, we present to you a proposal to draw up a daily menu of Indian recipes, so let’s start. Indian cuisine is inconceivable without paratha - it is a traditional crunchy bread triangular in shape, thickness of a pancakes. Its basic ingredients are flour from whole grains, vegetable oil and water. No yeast, which can be a valuable information for people who are fighting against candida. Depending on the region and the wishes of the host, caraway seeds, onions or any other spice can be added. Bread is usually dipped in sabzbi, which is the common name for a wide variety of flavoured Indian dishes or vegetables, which are a real vitamin bomb. For the main course of Indian cuisine, commonly recommended is Birján, similar to today’s chicken with rice, but much tastier. Chicken in Indian Style is marinated for hours in a spicy blend of ginger, cinnamon, turmeric, nutmeg and chilli, served with rice seasoned with lemon juice. While we usually consider snacks to be chocolate bars full of transfats or sandwiches from Fast foods, Indian cuisine proposes something else. In fact, between lunch and dinner enjoy a Samosama- that are crunchy, salty snacks triangular in shape. They are like Pancerota, but have a different filling. They are made from the dough that is filled with rip potatoes, onions, ginger, parsley, turmeric and chilli. They can be eaten dry or dip in mint sauce or tomato. Thanks to its ingredients, this speciality keeps stomach in good condition and is excellent in the prevention of cancer. As in the morning, eat it with vegetables, paratha is usually dipped in dal – a bean specialty made from lenses or chickpeas, which preserve the health of the heart, stabilize blood sugar levels and helps to regulate body weight. Roux garlic and hot peppers preserve the health of the stomach and protect against cancer. Chicken in Indian Style with lemon and parsley is also a good choice for dinner. In many parts of India people worship pakora - these are small snacks of vegetables, mainly onions, eggplants, potatoes, cauliflower and chili peppers. They are rolled in flour and baked in vegetable oil, perfect for consuming with fingers. 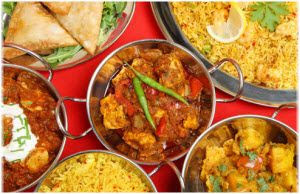 Indian cuisine is very diverse and colourful and some specialties we have already mentioned in the text, find out how to make them. Mix 1 + 1/4 cups of whole-wheat flour, 1 tablespoon of cumin seeds and 1 tablespoon of vegetable oil. Begin to knead the dough and gradually add water depending on the desired density. When you have threaded the dough and spread 1 tablespoon of oil and over it and leave it covered for 10 minutes, and then divide it into 6 balls. Each of them spread with a rolling pin. Sprinkle with a little flour and fold twice, so you get a triangle. Bake slowly on vegetable oil. Indian cuisine is simply inconceivable without paratha. Chicken in Indian Style is a real specialty, here is how to make one. Coat 500 g of chopped chicken white meat in 2 tablespoons of chili and a half a tablespoons of turmeric. Let it stand for half an hour. Meanwhile, in a blender mix the 3 hot peppers, 3 larger pieces of ginger root, 15 cloves of garlic, 1 handful of coriander leaves, 3 sticks of cinnamon, a little nutmeg, 1/4 cups of water and 2 tablespoons of fennel seeds. Chicken sauté for 2 minutes in olive oil, then add the mixture from the blender, 1/2 a cup of sour milk, 2 chopped tomatoes and a handful of chopped onion. In a separate pot cook 3 cups of rice, add a bit of clove, cinnamon, a handful of raisins and a handful of cashews. Get it in the pan with the chicken, stir well, add a little water and simmer until the chicken is done. Pour into the pan 2 and a half cups of almond milk and 2 cups and grated carrots. Let it boil, and then simmer for 15 minutes while stirring. Add 6 tablespoons of cane sugar and 2 tablespoons of butter. Once the carrots absorb the milk, add 1/2 cup of raisins, a little saffron, 8-10 chopped cashew nuts and chopped pistachios. Stir and cook for about 3 minutes. Serve lukewarm or chilled in the refrigerator. Mix 1 cup of flour and 2 tablespoons of vegetable oil. When the mixture has stabilised add 2 tablespoons of water. Let it stand for 20 minutes, and in the meantime simmer 3 tablespoons olive oil and 1/2 a tablespoons of chopped ginger root, 1/2 tablespoon of minced garlic, a little coriander and 2 finely chopped chili peppers. Add 1 finely chopped onion, 1/2 a tablespoon of turmeric, lemon juice, 1/2 a tablespoon of minced hot pepper and a little salt. Simmer for 2 minutes and add 2 boiled potatoes, mash them and stir the mixture. The dough is divided into 10 parts, and stuff it with the mix. Bake until dough is golden brown. In a pan pour 2 cups of water. Add 200 g of chickpeas, 1/3 cup of chopped onions, 1/3 cup of chopped tomato, 1 tablespoon of turmeric powder and 2 finely chopped chili peppers. Cook for about 15 minutes, until the beans are soft. Add 1 more cup of water if you want to get a less thick mixture. Meanwhile, the 2 tablespoons of olive oil and 1 tablespoon of cumin seeds, 5 cloves of garlic and a bit of ground chili peppers simmer together. Add the broth and let it stand covered for a few minutes. Then sprinkle with chopped coriander leaves. Indian cuisine and restaurants are becoming increasingly popular in major cities of the world. Be sure to visit such a place when you can, you will enjoy the abundance of taste, smell and colour. We recommend the article: What is Ayurveda.